32 cm  p. : chiefly col. ill.
Hey Wally watchers! 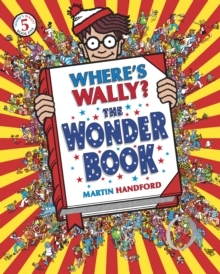 Join the hunt for Wally in his fifth wonderful adventure!Wally is now a global phenomenon, and this book is truly Wonder-full! Take the Wally challenge and go up and down the Corridors of Time, wander around the Fantastic Flower Garden, witness the Mighty Fruit Fight, visit Clown Town and see many other wondrous Wonderlands! Wally and friends are hiding in every detailed scene. Full of eye-boggling extras and hours of fun, this is the fifth classic Wally adventure. Wow! Amazing! The Where's Wally? series has sold over 72 million books worldwide.